I have big plans to draw and paint all day today. My car is in the shop (nothing wrong with it, just a check-up! ), so I will be at the house all day with my art supplies. I should really clean my living room, but art is so much more fun than cleaning. I made a few drawings yesterday after work, and I was pretty happy with them; photos soon... My mood is always so good when I am making art. I notice that during the work week, I hardly have time to draw and am often too tired when I come home, so by the end of the week, I am ready to burst with creativity after having no creative outlet all week. Is it like that for you too? Hope you have a fun and creative weekend! 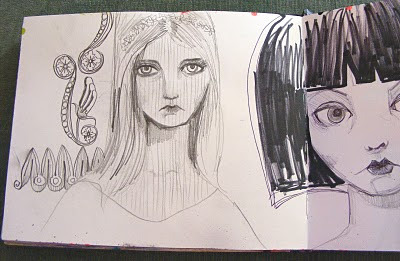 I love seeing your sketchbooks. You have a great style and I can't wait to see what you post next. 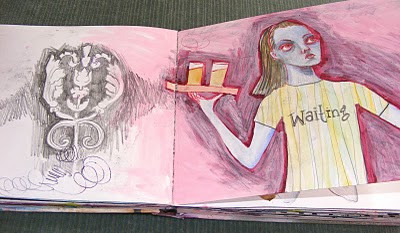 Thanks for showing us the inside of your sketchbook. Such a treat. Hope you had a great creative day! Can't wait to see what you've made!